Corrosive-free, maintenance-free outdoor portable table. Ensures durability with heavy-duty 2-3/8" O.D. welded steel frames. Protective thermoplastic coating provides exceptional UV protection that will keep your tables looking good for years to come. Table tops measure 46" x 46" (3 Seat ADA - 46" x 57", 2 Seat ADA - 46" x 68") and come standard with a 2-1/4" umbrella hole. 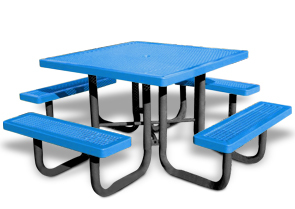 Table tops and seats are made of high strength 3/4" # 9 expanded metal and thermoplastic coated with a lightly textured Polyethylene finish in the color options shown below. For extra safeguarding, Surface Mount Clamps and In-ground Mount Posts can be ordered to help protect against the possibility of undesired movement of the table. Also, optional 7-1/2" and 8-1/2" umbrellas are available in any of the color options shown below, in either a single solid color or a 2-color alternating pattern.